The program’s structure is the same in each episode. For the first half, RuPaul dresses as a man, while during the second part he presides over the participants’ catwalk dressed as a woman. The transition from man to woman takes place suddenly. At a certain moment, the camera focuses on the jury members and their expressions convey amusement, surprise and admiration before we can see the female version of RuPaul for ourselves. After this anticipation, we hear RuPaul’s canned laughter and his silhouette appears backlit on stage, with his face at an angle still hidden in the shadows. Then a spotlight illuminates him frontally, Ru turns his face and looks towards the audience. Dressed up as a supermodel, Ru greets us by lifting his long arm and, while the music plays, he walks the runway downstage in full splendor. Similarly, in his book “RuPaul’s Guide to Life, Liberty and the Pursuit of Style” the artist underlines the importance of making an entrance both onstage and in life: “We are all familiar with the idea of making an entrance. It’s not just pertinent to the Broadway stage or the fashion runway. When faced with auditions, job interviews, first dates, or really nailing it in a twenty minute presentation, the first impression means everything”. This approach is interesting because it implies an understanding of theater as a transformation of forces in space, as an irruption which reconfigures pre-existing relationships by mere presence. Esoteric as it might sound, this statement should not be taken lightly: sound frequency is a handy metaphor for explaining affect. After all, we have all experienced how music interferes with our mood and our movements, and we can extrapolate this experience to other sensorial realms. In this sense, some affect theory scholars talk about the body learning to “play itself like a musical instrument to this world’s compositions”, about “affective attunement” or the fact that we are “immersed in a “music” of the world at a local level- a complex polyphonic, polyrhytmic surround”. The frequency waves Ru mentions go very much in the direction of this acoustic analogy. Moreover, besides all the affect unleashed by the colourful forms and moving shapes in the show, the TV host also seems aware of the affective power of sound for he constantly modulates his voice in a playful way when he says catchphrases such as “Oh pit crew!”, “Gentlemen, start your engines and may the best woman win!”, or even the name of some participants such as “Ivy Winters!”. The best example would be the “Bring back my girls” line that RuPaul utters in a different way in each episode after the jury’s deliberations. However, affect is not circumscribed to sound or music. No matter what we do, catwalking, standing still, talking, listening to a speech or watching an image on a screen, there is always affect going on. Even though RuPaul puts the stress on transmitting, we are also receiving all the time. It goes both ways in any given relationship. As Brian Massumi explains, “when you affect something, you are at the same time opening yourself up to being affected in turn and in a slightly different way that you might have been the moment before. You have made a transition, however slight. You have stepped over a threshold. Affect is the passing of a threshold, seen from the point of view of capacity”. When Massumi talks about “the passing of a threshold”, he refers to a minimum identifiable change in the body’s state which has consequences on what that particular body can do. While the Canadian philosopher mentions “the point of view of capacity”, RuPaul affirms that once you overcome the impact of negative affect “your ability to claim your greatness will emerge”. In different words they both claim it’s a matter of power. As Spinoza famously wrote in his “Ethics”, there are positive affects which increase our potency (love, hope, joy, interest, pride…) and negative affects (fear, sadness, anger, hate, disgust, shame…) which decrease it. At the same time, any positive affect can become negative if excessive and some negative affect is also essential for self-preservation, self-defense or critique. In this dichotomy between positive and negative affect, RuPaul clearly positions himself: “I don’t have time to be mired down in the mud. I’ve sung that song before and it ain’t pretty. I choose joy”. Indeed, in the TV show the ubiquitous presence of RuPaul’s canned laughs creates an ambience of joy which relies on the contagious nature of affect. Besides joy, the artist also promotes kindness in a very Buddhist way when advising in his guide that “few things are off limit, but draw a line at being kind” or by choosing to be “sassy, not bitchy” as a drag performer. 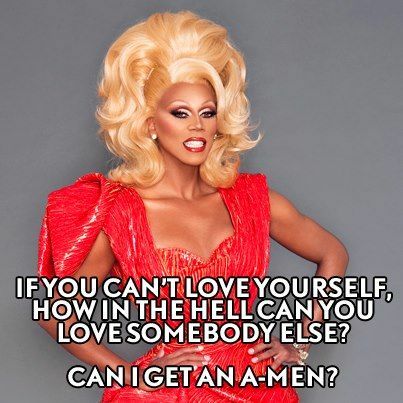 The slogans “If you don’t love yourself how the hell are you gonna love somebody else” and “Everybody say love” further show RuPaul’s leaning for positive affect. People who feel attracted towards their own gender receive an early lesson in affect politics. As homosexuality has been (and still is) a taboo in our society, among other mechanisms homosexual affection is repressed by shaming individuals. Any person identifying as gay has had to overcome the sense of “shame” or “disgust” society tries to impose on anyone with such desires. As Didier Eribon explains in “Insult and the Making of the Gay Self”, gay culture and political movements flow from the need to overcome a world of insult in the process of creating gay selves. RuPaul refers to this world of insult when he talks about the need to “love yourself” and overcoming “many years of fear and self-loathing”. This overcoming necessarily implies turning shame into pride, as the gay community collectively reaffirms year after year with the Pride parades since the Stonewall riots in 1969. Even though most of RuPaul’s practice is oriented towards positive affect, there are some exceptions, such as the “Reading is fundamental” challenge in the TV reality. In this exercise, participant’s wittily and incisively expose the flaws of other participants within a consensual humorous context. This ambivalence produces both positive affect (utterances are considered to be jokes) and negative affect (the jokes are in fact sophisticated insults). This training in humorous insults within a performance setting might be useful in other environments: coping with a world of insult is easier if you become an insult virtuoso yourself. Moreover, if you manage to make people laugh you are less likely to be physically attacked in retaliation, for laughter results from an unexpected connection and causes a certain startling. It might also trigger the complicity of people around you against the attacker who was targeting you in the first place. Finally, training how to deal with negative affect is also a useful by-product of this exercise. Periodically, we are all exposed to negative affect and absorbing/ignoring/deflecting this affect gracefully is not always easy. For instance, participants often receive negative feedback from the judges in the TV show. However, instead of processing the critique some participants feel offended and react against it. Being able to deal with a certain amount of negative affect is a basic skill in life, for no practice (artistic or not) can progress without constructive critique. Letting go of negative affect is difficult indeed. Three seasons before Ru had already shown his affective wisdom when he told Katya that she was addicted to anxiety. Katya is caucasian and her anxiety is not related to racism. However, just like with anger you can get hooked to the intensity of a negative affect such as anxiety in spite of its disastrous impact. A long sufferer of panic attacks, Katya herself is taken aback by the exactitude of this comment, which falls upon her as a revelation. Addiction to negative affect is an interesting field of research for it acknowledges that individuals get a psychological or physical reward from it. In a time where hate, fear and anger are on the rise, it is difficult to challenge these affects without understanding its reward mechanisms. The handling of affect becomes an important skill in many other ways in the TV show. For instance, some participants induce negative affect with an apparently innocent sentence aimed at mining the opponent’s confidence. Roxxxy Andrews doesn’t hesitate to use this trick in order to increase her chances of winning the competition. Controlling affect is also essential in one of the first challenges in season ten, where RPDR participants need to catwalk among fierce participants from earlier seasons which are simply present in the space. As in the case of RuPaul’s appearance in drag, mere presence transforms the arrangement of forces in space. If they feel intimidated, participants will fail. As it starts to become apparent, Ru’s affective insight can be linked to gay and black culture, but it can also be connected with theater and performance in general. After all, performing implies a certain affective virtuosity, a control over bodily fluctuations both onstage and in the audience. Antonin Artaud, who considered actors “affective athletes”, observed that indeed “One must grant the actor a kind of affective musculature which corresponds to the physical localizations of feelings. The actor is like the physical athlete, but with this surprising difference: his affective organism is analogous to the organism of the athlete, is parallel to it, as if it were its double, although not acting upon the same plane.” Or otherwise, with a Spinozian vocabulary (the Dutch philosopher referred to affect as passions in his “Ethics”), Artaud also describes acting as “to join with the passions by means of their forces” amid a thousand references to the body. We would like to insist once again that it is both a matter of transmitting and receiving, for good performers often create a feedback loop with the audience, using the audience’s affective input as a reference for modulating affect onstage. Besides these necessary affective skills, actors also need to overcome a phenomenon known as “stage fright”. The very act of performing involves exposing ourselves to others. No matter how successful their careers, all performers have experienced rejection/shaming/anger from audience members at some point. Performing always involves an extraordinary amount of confidence, for the risk is very real. Even though public exposition is intensified in performance, it is also part of everyday’s life where we also continuously perform in front of others. After all, the world’s a stage too. So nobody is totally free from internalized fear, which RuPaul personifies as “The Saboteur”. According to the cross-dressing artist, the saboteur is “your inner critic, aka your ego mind”. We partially disagree: your inner critic is part of the ego mind but it is not to be confused with the ego as a whole, for the ego is an illusion built with a thousand different pieces. In this sense, in season 7 Katya finds a smart strategy in order to deal with the voices in her head which tell her she is not good enough. Instead of identifying these voices as part of herself (her ego), she creates a fictional character named Brandon to personify the voices in her head and tell them to “shut up”. For these and other reasons, as Ru says in his guide, “it takes a lot of hard work to remain positive”. However Ru wants to share with his readers his affective tricks: “In these pages, I’ll share with you some of the daily practices that have helped me keep my frequency clear” and thinks of this exercise as the key to reveal “your inalienable freedom”. In the following pages of the guide RuPaul’s tips go from motivational slogans (“Rise up and be fearless, like a Maasai warrior”) to instructions on how to shake hands or the importance to pay simultaneous attention to the person you are speaking with and to what is happening around the room. From the benefits of not mentioning negative things about other people to wig sizes in relation to your height. From the importance of body posture to how to highlight the curves in your figure with padding. Some might be surprised by this mix of tips aimed at handling both body sensations and external appearance. Perhaps this is the most basic yet most profound lesson of the TV show: colour, shape and texture are e-ve-ry-thing. The affective dynamics going on across your body can’t be separated from the way you look, that is, from the social phantasy you embody for others with the help of the prosthesis you wear. For this reason it is no surprise that some politically aware participants resist changing their drag style when the jury suggests they should. As grunge Adore Delano says in RPDR All Stars 2 before quitting the program voluntarily: “I believe in beauty in a denim jacket and barefoot”. Giving up that aesthetic would also involve giving up the politics associated with it, so stepping down from the program in these circumstances is actually a very consequent choice. 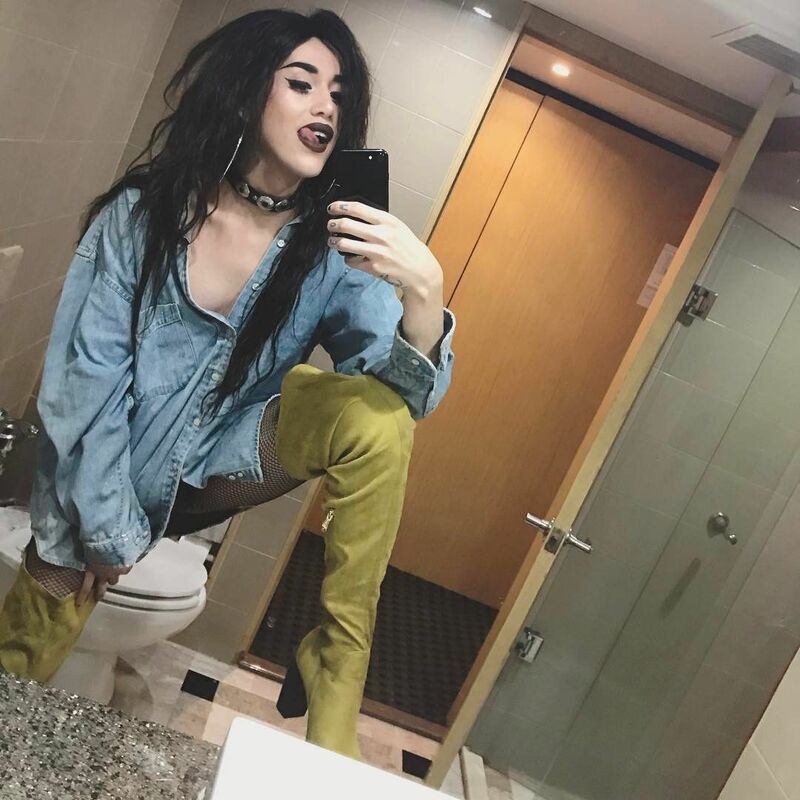 Indirectly, Adore Delano’s conflict also reveals one of the limitations of RPDR: hyperfemininity predominates over other styles of gender representation. This hyperfemininity that clashes with Delano’s grunge aesthetics can be attributed to many factors. It may be an ideological bias of participants or the jury. It may also be embedded in the parodical nature of the “drag queen” practice, for parodies rely on deliberate exaggeration for comic effect. Personally, I would like to understand Delano’s controversy as the result of a generational gap. The specter of femininity would not hold such a strong grip over the younger generation, who would like to handle its signs in a looser, less stressful way. Finally, even though we don’t deny individual agency, we should wonder about the nature of the “inalienable freedom” RuPaul speaks about in relation to affect. As affect always goes beyond oneself, we should develop an understanding of freedom which could also take into account our interdependence with other bodies. Which kind of freedom could this be that depends both on ourselves and others? We will discuss this aspect further in this article. This particular conflation of affect, performance and politics evokes a character one might not expect in a text about RPDR: Donald Trump. Even if Trump and RuPaul’s values could not differ more, there are some striking analogies. First of all, both Ru with his stunning looks and Trump with his tweets punctuated with insults and words in capitals are masters at modulating affect. Actually, a drag queen is not a bad model for explaining Trump’s figure, for Trump delivers a continuous performance overloaded with affect. However, while RuPaul mainly radiates positive affects, Trump spreads negative affects such as anger, fear and resentment in order to achieve his goals. The exploitation of affect by politicians is not new. In the XVIIth century Spinoza already explained how political leaders used fear in order to secure their control over the population. Brian Massumi analyzed how George Bush instrumentalized fear after the 9/11 attacks. “Hope” being one of his main slogans, Barack Obama developed instead a campaign based on positive affect. However, if this phenomenon is not new, it requires renovated attention in the current rise of the far right, with progressive actors often complaining about voters leaving aside rational explanations when choosing their political leaders. Indeed, even though reason still plays an important role, it does not seem to be the main level politics are operating at nowadays. Film director Michael Moore, one of the few progressive personalities that viewed Trump as a real threat before he got elected, lucidly declared during the campaign: “Other candidates couldn’t find a way to bring him down. And now Hillary Clinton is trying to do the same thing using logic and brains. It’s going to require something else. Personally I hope satire brings Donald Trump down.” That is, when reason is bypassed by affect, it needs to be addressed with affect. In this case Moore proposes satire which -a bit like the “Reading is fundamental” challenge- could be seen as a device both for shaming Trump and spreading positive affect at the same time. This mixed affect strategy has to be underlined, for as we previously stablished negative affect can easily lead to negative affective loops, so adding anger to anger or fear to fear might only make things worse. Pure positive affect alone might not be enough to fight negative affect either. Only if we add a huge amount of humor and tenderness to our combativeness might we be able to stir things in a different direction without creating a negative affect loop. In the previous section we explained how affect is closely related to power. Indeed, Trump and RuPaul also share a close relationship with power in very different ways. Trump fought for the presidency of a powerful country and is now operating at the level of macropolitics. On the other hand drag queens project a power fantasy, for “a queen” is the ultimate power archetype for women. However, this gendered power fantasy operates at the level of micropolitics. Instead of having an imperative effect on reality, it opens up possibilities for the self and others through representation. Ru fully embraces this power fantasy in his role as a leading judge in the TV show. As he often declares when deliberating in drag: “I have consulted with the judges, but the decision is mine to make”. Ru’s admiration for the somewhat authoritarian Judge Judy -a retired judge hosting a TV program in the USA- is also a symptom of this passion for the representation of power. The subtle play between the representational layer of power and actual status can be traced in other places. For instance, as once Ru mocks himself when deciding to change the program’s rules on the go: “By the power invested in me by… me”. That is, the self provides power to the self by representing her/himself as powerful: an exercise in self-empowerement. Although RuPaul works within representation, the desire for real power is not simulated. When RuPaul portrays himself as a presidential candidate or as both the Obamas at the same time there is an ambivalence that turns the images into a very serious jokes. Why not a drag queen for president? This tension between power and representation is actually embedded in the TV show and the voguing balls which inspire it. After all, the participants’ purpose is precisely the negotiation of power through representation: those performing better theatrically gain a higher status. 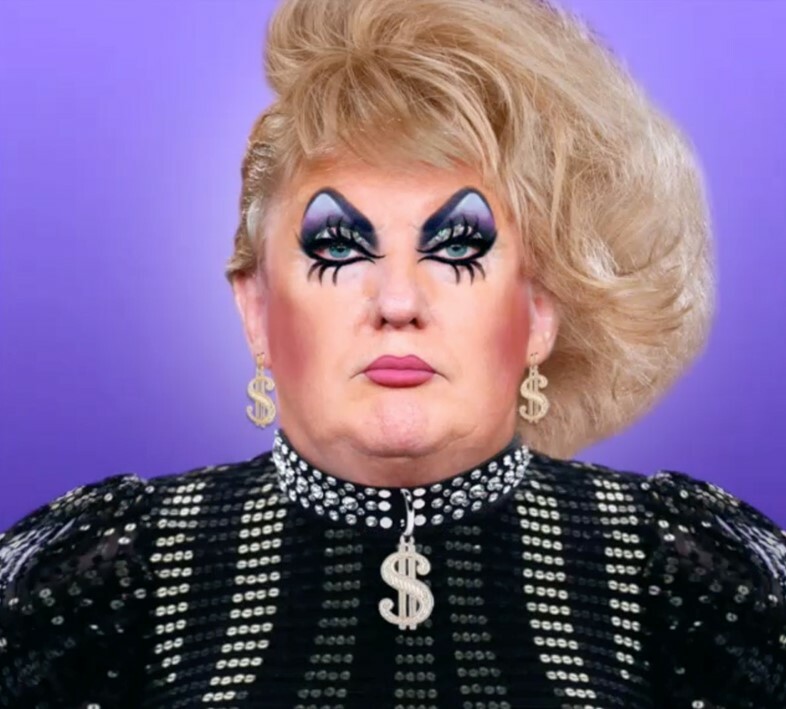 This structural device is important for it allows us to trace new analogies and differences between RuPaul and Trump, for both figures have hosted for many seasons a reality TV show where participants compete against each other. As any performance, talent shows can be considered both the result of an existing order (insofar they emerge within certain technical, political and economic conditions) and an archetype for future social developments, for representation provides social dynamics models that audiences might follow depending on how much these resonate with them. In the talent show format, representation (mimesis) and competition (agon) are tightly knit, but often with different shades. Moreover the talent show model has a cultural significance in itself. As Jon McKenzie explains in “Perform or Else”, multiple meanings of performance are increasingly overlapping in our culture, specially those related to representation and profitability. “The Apprentice” represents one of the ultimate examples in this sense for the show (representation) consists precisely in making as much money as possible (profitability). Additionally, in The Apprentice competition prevails over any other aspect that might get in the way of profitability. This means that competition is more important than social bonds and the show adequately describes itself as “the ultimate jungle”. Representation is subdued to competition. This specter has been hovering over our spectacular neoliberal societies for some time now. Fiction films about talent shows where competition radically overtakes representation can be considered symptoms of this looming threat. Either in Yves Boisset’s “Le prix du danger”, Paul Michael Glaser’s “Running man” or Gary Ross and Francis Lawrence’s “The Hunger Games”, Jon McKenzie’s prophecy is taken to the limit: perform or die. With a shrinking welfare state, cuts in public healthcare and current immigration policies, Western democracies are disturbingly approaching this dystopian vision. On the other hand, in RPDR there is definitely competition -as Lashauwn Beyond puts it in season 4, “This is not RuPaul’s Best Friend Race!”- but the emphasis falls on representation. Additionally, creating social bonds is often declared an important goal in the program, with RuPaul considering all participants their “children”. As Asia O’hara describes in season 10, “You are creating family outside your blood family”. Whereas in Trump’s reality show participants were abruptly dismissed with a “You’re fired”, RuPaul often says farewell to participants with praise and encouragement. As a matter of fact, participants are often reintegrated in future seasons, spin-offs or live events related to RPDR. The creation of intricate social bonds is an important aspect of RPDR but it was even more significant in the original voguing balls. In this setting, voguing participants were awarded symbolic trophies, but participants were mainly eager to be recognized by their peers. It was social status itself which was at stake. In addition, this system had a very specific relationship with time, for status was not given once for all, but was the result of constant practice. Skills needed to be proven over and over until you became “legendary”. In the balls, “legendary” was an honorific title awarded when your deeds had been proven over such a long period of time that no one could question their meaningfulness anymore. This is a common ambition among crafts(wo)men: the production of outstanding “works” creates a powerful narration about the self. In other words, it entails giving meaning to existence by continuously pushing the boundaries of technical achievement. In relation to this phenomenon, Richard Sennett -author of “The Crafstmen”- says that it entails “being proud not of ourselves, but of our work”. In slang, vogue dancers are said to be “working” and indeed it there is lots of work behind any presentation. But we should also take this expression literally in agreement with Sennett’s statement: the artist’s work becomes the object of social scrutiny and determines the artist’s status. However this technique for distributing power through representation has its own weaknesses and perils. First of all, it depends on the criteria of a panel of judges which might make controversial decisions. In this sense, it is a very hierarchical structure which fully depends on the wisdom and responsibility of those at the top. RuPaul is fully aware of this flaw and in seasons All Stars 2 and 3 he proposes a solution to further involve participants in the decision-making. Instead of selecting the two worst participants and making them compete against each other in a “lip-synch for your life” challenge in order to avoid elimination, the judges select both the two best and worst performers in the episode. The two best performers then compete against each other in a lip-synch “for their legacy”, that is, as a way to claim their status by producing a memorable performance. The winning participant in this challenge also decides which of the two worst performers is sent home at the end of the episode. The criteria for making this choice are object of long debates in the program. As RuPaul says quoting both Voltaire and Uncle Ben from Spiderman, “With great power comes great responsibility”. Indeed, some participants like Bendelacreme have a hard time when repeatedly given the burden of power. Still, it is an excellent exercise in participation politics, for it forces competitors to reflect and participate in decisions instead of merely following the dynamics of an already established political system. We insist that competition does not disappear from RPDR but it is mixed instead with representation and transformed into a device for creating social structures. The threat of the “ultimate jungle” does not disappear completely, but is heavily ritualized. The constant use of representation allows participants to negotiate power without resorting to force. So the “law of the jungle” is substituted by a representational technocracy which produces it own hierarchy. Practice generates unstable evolving power relationships between participants. In relation to the impersonations in “Paris is burning”, Peggy Phelan explains in a classical article that “the balls reveal the performer’s longing to be made unremarkable -to pass as “normative” (and thus be unnoticed) rather than to be seen as “other” outside the arena of the balls, the walkers employ the hypervisibility of the runway to secure the power and freedom of invisibility outside the hall”. Pepper Labeija is right to point that black populations taken by force to America have had to learn “the way of living or looking or dressing or speaking” of the white population in power in order to thrive. We could consider the balls as part of a mass bodily reeducation maybe still in process. However, we could also look at the balls from the point of view of mimesis and bodies’ tendency to reproduce anything they get in contact with. In this sense, there are some striking similarities between the balls in Livingstone’s film and the phenomena that Jean Rouch immortalized in “Les maîtres fous” (The Mad Masters). In this 1955 film, the practitioners of a Nigerian religion imitate the behavior of white men in the context of ritualized trance. As in the original voguing balls participants were black and latino, could balls be a trace from African rituals carried out by slaves, just like santería in Cuba or candomblé in Brazil? This is a provocative question, for voguing balls are much more likely to have appeared directly as an idiosyncratic mimesis in New York in the 80’s. Even so, it is an interesting question for it forces us to consider up to what extend the gestures we make every day are ours or have been transmitted to us. Specially, because body memory is much more powerful than it is generally stablished in Western contexts. As an anecdote, Brazilian artist Virginia de Medeiros produced a videoinstallation titled “Sergio e Simone” (2009) which narrates the story of Simone/Sergio, a black transvestite from Salvador de Bahía who practices candomblé. After a life-changing experience, Simone/Sergio rejects his past, converts to Evangelism and embraces a male identity. Throughout the recording, the protagonist changes her/his name, gender and religion, but either before or afterwards she/he experiences trance episodes linked to Candomblé or Evangelism. That is, the body is able to keep repeating the same gestures even with divergent meanings in different contexts. This example brings us back to transvestism by no accident. Trance is related to transvestism etymologically with the Latin prefix which means “in between” and testifies to the liminal character of both practices. Beyond this parallel, as in sexist cultures “femininity” constitutes a taboo for male identity, the reproduction of female looks and behaviors during trance dissociation might also be a ruse to come to terms with it. As anthropologist Erika Bourguignon affirms, during trance “the playing of alien roles may not only be a way of providing temporarily various options to the individual, it may also be a symbolic and ritualized way of coming to terms with the foreign or the dangerous”. This quote is relevant because it alludes to trance not only as the representation of a context but also as a negotiation within this context. Indeed, very often trance is linked to social re-organization. Bourgignon’s quote comes from a compilation of essays titled “Religion, altered states of consciousness and social change” where different academics examine different trance rituals and their relation to social malleability, from the Brazilian Umbanda to the Shakers of St. Vincent or the Apostolics from Yucatán. It is this “space of suspended agency” between bodies or between bodies and objects which we can call, encompassing a wide array of phenomena at varying levels, “trance”. It is important to note that these processes are transcendental -they go beyond the self- and they imply a sharpening of the senses addressing a conglomerate of actors (ourselves in relation to the others, ourselves in relation to an object…). The intensity of the experience then allows us to redefine our own understanding in relation to the outside world. Another term just as problematic for this phenomenon might be animism, for the phenomenological outer world penetrates the body and transforms us. In the words of Isabelle Stengers in her article “Reclaiming animism”, “one is never animist “in general,” always in the terms of an assemblage that produces or enhances metamorphic (magic) transformation in our capacity to affect and be affected”. Even though both “animism” and “trance” are problematic terms, we still use them because in our culture we do not have better ones for naming these physiological phenomena where the senses are sharpened and the self somewhat suspended. Still, it is important to develop some socially acceptable vocabulary for describing a form existence which does not merely claim to take place in the world, but puts the emphasis on the entangled relationship between the world and us. This vocabulary is also extremely useful for dealing with practices which, again in the words of Stengers, have “nothing to do with representation, but rather with metamorphic engagement”. In the RPDR show the traces of such an understanding of the drag practice are literally present in the vocabulary, with several participants using the verb “channel” to describe the process they go through when presenting their drag. One of the meanings of channeling is “to serve as a medium through whom the spirit of a person allegedly communicates with the living”. For instance, in season 2, Sahara declares “I am definitely channelling my inner Rock Goddess”, while in season 3 Delta Work affirms that “I’m channelling just like Mae West, or in season 4 Dida Ritz states “I am definitely channelling Naomi, I’m channelling Gisele, I’m feeling it”. Or as Todrick Hall puts it when describing Eureka’s transformation when recording a song in season 10 episode 12, “when you are in it and your hands are moving and stuff, it’s like the Holy Ghost has crept into Eureka”. But maybe the most striking formal analogy with trance in RPDR is “the lip synch for your life/legacy” challenge. The aim is very simple. Two participants lip-synch the same song next to each other on a stage. The interpreter yielding the most compelling performance wins. Literally, it is about embodying an absent body by letting your own body be carried away by its voice. Cross-dressers become mediums possessed by a spirit which talks through their mouths and guides their movements. I know some may still find difficult to associate trance with the original voguing balls or RuPaul’s Drag Race competition, for our understanding of the term is embedded with exotic images and references. However, we should remind ourselves that trance has had a major influence in the history of Western representation. Greek theater is said to have originated in the Bacchic Rites, which were no less than collective trance rituals in honor of Dyonisius. Moreover, some contemporary artists like Viennese actionist Hermann Nitsch have relied on this model for crafting their avant-garde performances. Although this connection between trance and performance may puzzle some, perhaps we should be more surprised about Western contemporary theater not being used for renegotiating social roles and structures directly more often. As if the aesthetization of the practice had curbed its original purpose. This text has been an attempt at understanding the implications of some bodily techniques using RPDR as a specific case study with some comparative support from voguing balls, talent shows and trance rituals. Indeed, we have been discussing different body techniques all along: from making good first impressions to affect modulation, talent show performances or trance as a physical technique for negotiating the self. In hugely different levels, these practices are “ways of doing” with the body, that is, sets of gestures between the social and the individual with a transformative power on both. This kind of analysis is full of complications. For a start, it is difficult to set the boundaries of any given technique we might be studying. As any rehabilitation physician working with stroke patients knows, something apparently as simple as putting on a shirt requires a whole set of complex skills that could be considered techniques in themselves. So, the analysis of a body technique can be approached in many different ways depending on the focus. Drag can be considered as a single technique in itself but it could also be studied as the sum of other techniques ranging from make-up to fashion design, from lip-synching to cracking jokes, from dancing to impersonating. Another difficulty stems from the fact that body techniques have political implications at different levels simultaneously and occasionally some of these might point in conflicting directions. For this reason, the analysis of bodily techniques requires long observation, attention to detail and a real finesse when articulating in words subtle phenomena in the physical world. Moreover, in order to obtain some deep understanding about any case study we need to take into account two different levels which are not always easy to differentiate: the politics embedded in the bodily techniques themselves and the politics embedded in how these techniques are used at a certain moment. For instance, one might be tempted to say that the political implications of yoga are related to calm, balance and flexibility. However, as experienced yoga practitioners know, in certain hands it can become a highly authoritarian almost military practice. There is always a potential gap between the material politics of a certain practice (related to form itself) and the politics of a group of practitioners when practicing it together (related to why, how and by whom this form is reconstituted at a certain time). Problematically, RuPaul Drag’s Race constitutes an example of theater within theater, so in this case study there would be not two but actually three levels to be analyzed: the drag performances themselves; why, how and who prepares these performances (RuPaul’s instructions, the sewing of the dresses and rehearsals, for instance), and then how and why the TV program itself is made. However we haven’t addressed the shooting and editing layer of the show because -even though some inferences can be made from the final product- we don’t get much information about the shooting conditions themselves. Still, the other two layers -“official” performances on stage and the rehearsal and preparation of these performances, which are also another type of performance within the reality show- have a great significance. The TV series becomes not only a catalogue of performances but also portrays how these are elaborated. That is, the program shows both the result of a certain technique (the performances) and some aspects about the technique for achieving this result (the work behind the presentations). So in a certain sense, RPDR is already pointing towards the need to share technical knowledge in order to turn the practice into an open-source tool. Indeed, RuPaul encourages viewers to become practitioners and one of his catchphrases is “Do drag!”. This perspective was emphasized in one of RPDR less successful spin-offs, “Drag U”, where “U” stood both for “you” and “university”. In this spin-off, drags taught biological women their techniques with the aim of empowering them. Knowledge transmission was put on center stage. Despite all these difficulties, why insisting on analyzing body techniques? As human bodies have amazing mimicking skills, we can’t never be sure up to what extend our gestures are really ours or have been passed on to us. More importantly even, as “ways of doing” are often transmitted implicitly or learnt accidentally, we might not be aware about the political and performative implications of our own bodily habits. Gaining a deep understanding of what we do repeatedly with our bodies gives us an idea about how reality is produced around us. Instead of having to resort to supranatural forces for explaining certain processes (for instance “the spirit”, as RuPaul calls it), we might be able to understand the actual physical forces at work in our interactions. Sociologist Marcel Mauss is enlightening on this subject in his text “Techniques of the body”: “[Bodily] ‘habits’ do not just vary with individuals and their imitations, they vary especially between societies, educations, proprieties and fashions, prestiges. In them we should see the techniques and work of collective and individual practical reason rather than, in the ordinary way, merely the soul and its repetitive faculties.” That is, instead of attributing certain qualities to the soul -“the spirit” in the words of RuPaul-, we should understand that what we call “soul” or “spirit” is nothing but the sediment of a multiplicity of body techniques which have been learnt and are repeated over and over. As informed readers have already noticed, this text resonates with several Western traditions claiming the importance of materiality and physical experience, the latest of which is often referred to as “new materialisms”. Indeed, it is essential to highlight the importance of materiality and bodily experience over and over, for Western culture is often based on binary oppositions such as “mind” vs. “body” or “reason” vs. “experience”, where “mind” and “reason” are considered to be more relevant than “body” or “experience”. This binomic thinking pattern is also connected to sexism, for it is the same logic behind the dual conception of gender where “men” are opposed to “women” and allegedly superior to them. Sexism and logocentrism are therefore linked to each other and can be considered different aspects of the same phenomenon. French philosopher Jacques Derrida even crafted the term “phallogocentrism” for underlining how both components are part of the same system of thought. Obviously RPDR does not intend to reverse the existing thinking pattern by replicating dual oppositions in a different direction. That is, both femininity and the body are given importance but they are not defined in opposition to masculinity or reason. This would merely perpetuate a dual conception of the world with different values. By giving value to femininity and breaking the social taboo which does not allow men to embody so-called “female” attributes, RPDR actually produces endless crossings between both categories, thus encouraging an incredibly complex understanding of reality. Likewise, in RPDR the body is of outmost importance but it is not opposed to reason. In the show body and experience are capital but language and reason are also essential for achieving social agreements about the significance of experiences taking place at other levels. In this sense, the jury’s comments about RPDR performances or the discussions among participants in the “Untucked” series are essential feedback mechanisms contributing to give meaning to experience. Incidentally, this text itself intends to be a small collaboration in this direction by trying to explain the forces at work behind the physical experiences in RPDR. The difficulty for doing so testifies to the complexity of the multiple devices in the TV show. This capacity for generating sophisticated discourses about social dynamics reveals how much there is at stake in RPDR. Its potential goes far beyond undoing gender categories, as it might help to substitute a whole system of thought by a far more complex worldview. This intricate perspective opens the door, in turn, to important modifications in the social structures we inhabit.